The Social Media tool keeps undergoing useful enhancements. 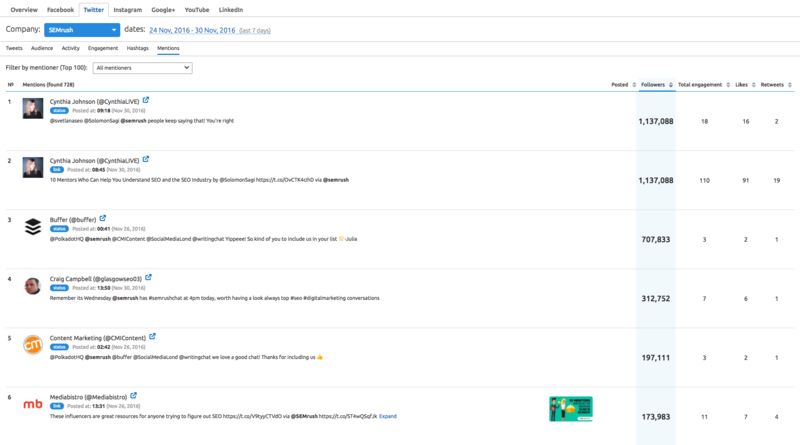 This time we’re introducing a new separate tab at the top-level section of the tool – Twitter. And it’s obviously it’s used for Twitter data analytics. 1. Tweets. This is basically a list of tweets published within a selected period of time (the last seven days by default) in all Twitter profiles added in your campaign. You can filter this list by type of tweet or hashtag(s). It can also be sorted by total engagement (default), number of likes, retweets, replies and post time. 2. Audience. Use this report to track changes in your number of followers and see how many you have compared to your competitors. 3. Activity. An extremely helpful report which shows how frequently a profile you’re interested in is posting tweets, what types of tweets are being posted, and which tweets your followers are engaging with the most. 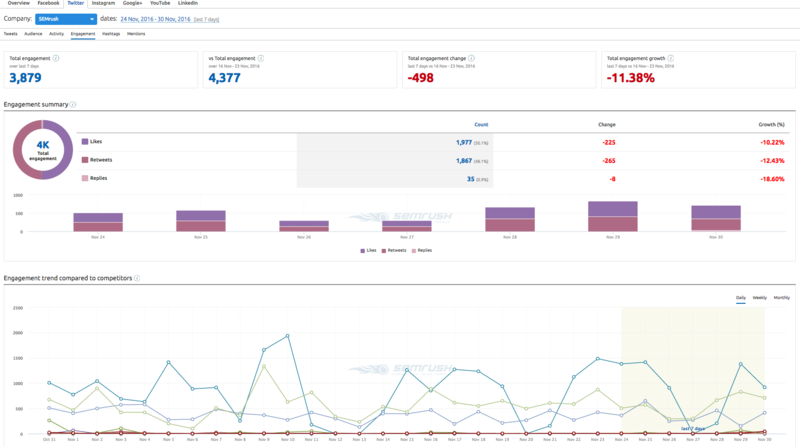 The Activity report also allows you to compare your competitors’ posting activity levels. 4. Engagement. Here you can see engagement data on content published during a selected date range: how many times users engaged with content, what type of engagement prevailed (likes, retweets and replies), and historical trend. This report also compares all this data to your competitors’ metrics. 5. Hashtags. This report shows all hashtags that have been used in at least one tweet posted by one of the Twitter profiles added to your campaign within a selected date range. 6. Mentions. As the name suggests, this final report will show you who mentioned a selected Twitter profile and in what context. We will continue making the Social Media tool more handy and advantageous, so stay tuned and don’t forget to send your ideas and comments on this update to [email protected].